A belated but none-the-less very warm welcome to our new members! Hopefully you’ve managed to get some time on the tennis and/or squash courts. On 24 January 2018 we will be holding a new member evening at the club where you will be able to meet the club committee and two Head coaches, and find out more about how you can take advantage of our great facilities. At the last Committee meeting, it was noted that our membership has remained strong, our finances are healthy, and our facilities are in great condition (apart from two tennis lights not working). So many people visiting our club have commented on how great everything is looking – it’s pleasing to see the work put in over the last few years is noticed by so many, and that our facilities are being looked after. In the New Year we will start working on renewing our Strategic Plan and will provide member updates on our progress. For those members who get to the club on bikes, it’s disappointing to note we’ve recently had a bike theft – please remember to lock your bike when you get to the club. In the New Year we will look at how to improve bike security for everyone. Lastly, at our club quiz night in September, Juliet Dewes very kindly donated some Wimbledon cufflinks and raffled them to help with club fundraising. A total of $520 was raised, with Ross and Julie Kingdom being the lucky raffle winners. Some of these proceeds have been allocated to junior tennis and squash initiatives, however we will also be able to purchase a new bench seat for tennis court 3 in the new year. Lastly, on behalf of your Committee I hope everyone has a safe and enjoyable Xmas holiday break. Our Saturday morning junior coaching programme this term has seen huge numbers of kids attend. The term 4 programme finished on Saturday 9th with Geoff’s Santa morning again proving a highlight for the kids; 300 balloons of water were filled and thrown at the coaches, and Santa gave out a lot of presents! And don’t forget, with Xmas fast approaching, Mark has some fantastic deals in the Pro Shop for those looking for a new racquets or tennis shoes. 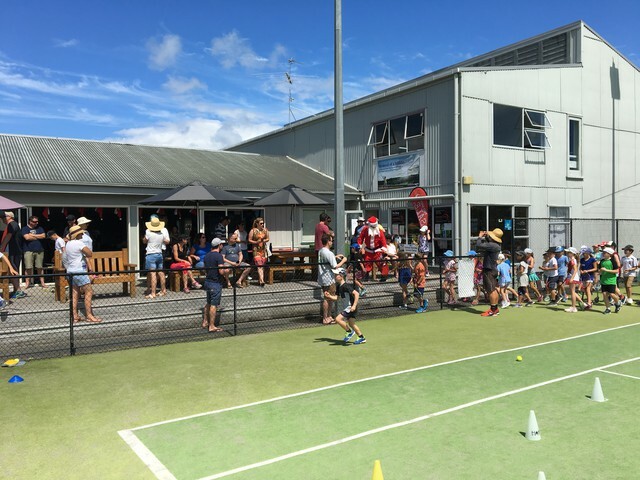 The term 1 2018 junior Saturday tennis programme recommences on Saturday 3 February at 9.00 am. We had planned to hold the Ray and Aly Adams Mixed Doubles tournament in November. However, due to several members having catch up interclub matches to play on Sundays, we’ve postponed the event until February next year. In addition to these awards, Manu has also been selected as the travelling coach for the NZ Junior Boys team going to the World Juniors in Chennai next July. Also last month, the senior squash club championships were played. In the Women's final, Natalie Sayes defeated Jane Priddy, while in the Men's final, Matthew Lucente defeated Gabe Yam. Congratulations to our 2017 senior squash champions. Lastly, don’t forget Manu’s Xmas holiday programmes – just go to his website for details http://www.mysquashcoach.nz/programmes.html.